Dr. Gunter is a Principal Lecturer in Criminology and Programme Leader for the BA (Hons) Criminology & Law degree. 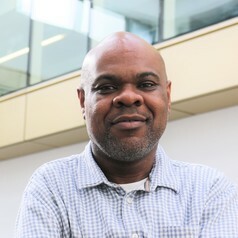 Prior to his career in academia Anthony worked for over 14 years in both South and East London, within a variety of community settings, as a detached community and youth worker and Project / Area Manager. Using ethnographic research methods to explore: contemporary urban youth subculture(s) and alternative youth transitions; serious youth violence and the ‘street gang’; youth crime prevention practice and neighbourhood policing; race/ethnicity, crime and justice. Gunter, A. (Dec, 2008) ‘Growing up bad: black youth, road culture and badness in an East London neighbourhood’, Crime Media Culture, vol. 4, no. 3, pp. 349-365. Gunter, A. (2003), ‘The Trouble With Black (Male) Youth’, Criminal justice Matters No 54. Gunter, A. (2015) Growing up poor in austerity Britain: multiple deprivation and poor transitions in one super-diverse East London borough, ESA 2015 Conference, Prague – Czech Republic. Gunter, A. (2014) Street Gangs, Serious Youth Violence and Policing in the UK: The perspectives and experiences of Young People growing up in two poor East London Neighbourhoods, EUSARF 2014 Conference, Copenhagen – Denmark. Black youth; youth cultures and transitions; serious youth violence and gangs; race/ethnicity, crime and justice; urban crime; youth work/crime prevention practice; policing multi-ethnic urban neighbourhoods; ethnography. Teaching and administering modules on the BA Criminology and Criminal Justice and BA Criminology & Law programmes. Anthony is also Programme Leader for the BA Criminology and Law degree and has lead responsibility for Professional Development and employer engagement within the Criminology Subject Area.